There is no midnight snack without alcohol. Let me introduce, probably the most famous abroad, Polish alcohol (except pure vodka, of course). and, tensai’s favourite! ŻUBRÓWKA, that’s how it’s called. in english: bison grass vodka. it’s still vodka, which means it’s strong but it smells nice and tastes much more delicate than pure vodka. especially when you drink it mixed with apple juice which is called tatanka. mix of żubrówka and apple juice is called TATANKA. 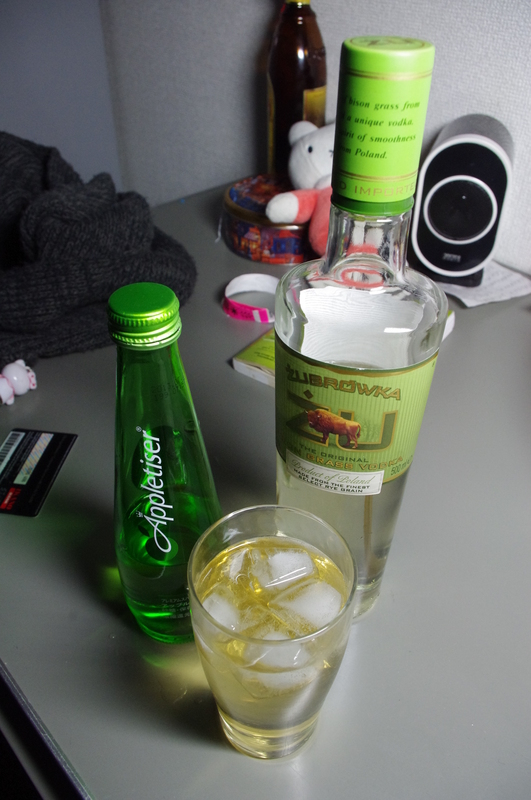 One great thing about żubrówka is that you can buy it almost everywhere. We’re buying it in Japan without any problems. I love this vodka … A Polish lady in Krakow airport recommended it to me. I had no idea of the name Tatanka. I will remember it now! Yes I do … and I’m drinking it in Wales! Ważne by sok był odpowiedniej jakości.